We are so excited to be a part of the 7th annual hair donation event at Algonquin College! 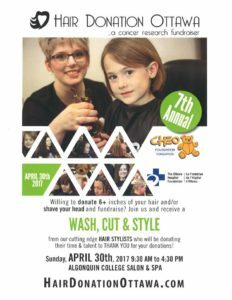 Every year Hair Donation Ottawa helps the lives of children dealing with illness-related hair loss, by giving them a renewed sense of hope and belonging . Hair Donation Ottawa is a 100% not-for-profit organization that that supports Cancer Research in Ottawa, as well as providing wigs and head scarves to children dealing with hair loss. This weekend come by Algonquin college if you are willing to donate 6+ inches of hair in support of Canadian Cancer research. When donating your hair, you will receive a cut, wash and style from Caralyn’s hair team to thank you for your amazing contribution to a great cause. This is an amazing organization that helps the lives of children everywhere by providing hair treatment options for financially disabled families dealing with horrible illnesses. Create a GLOBAL impact this weekend, by registering as a hair donor and becoming a part of Canadian Cancer research!